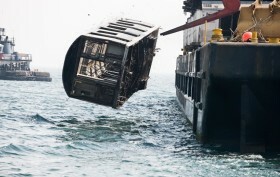 Who knew that the graveyard for decommissioned NYC subway cars was at the bottom of the ocean? If this is news to you, then you don’t want to miss this photo series by Stephen Mallon, who documented the train cars being dumped into the Atlantic from Delaware to South Carolina over three years. But before you call 311 about this seeming act of pollution, let us tell you that it’s actually an environmental effort to create artificial reef habitats for fostering sea life along the eastern seabed, which was started over ten years ago.